Some of the covers fit together! I’ll begin this review by saying I’m really not the best person to review the Dungeon Fantasy Roleplaying Game (DFRPG). It’s not that dislike it: in fact, I loved it! However, I’m really bad at reading through the text in detail and spotting all the differences between the game and the GURPS supplements that originated it. I know these differences exist, and I know they make the game better, but I’ll probably only internalize them when I reference the text in play enough times. Fortunately, it seems I’m late to the party when it comes to reviewing the DFRPG, so I can point you to lots of other reviews by other people who are better at this than me! 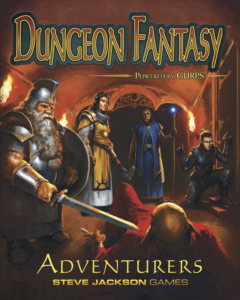 Just Roll 3d6 has very detailed reviews of the Adventurers and Exploits books. Let’s GURPS is reviewing all the recently-released books too. And I’m sure many other reviews will pop up in time. What I’ll do in this article is something only I can do: give you my own opinion on the game. Whether that is of any value is left as an exercise for the reader. The Dungeon Fantasy Roleplaying Game is my favorite edition of D&D. Go out and buy it as soon as it comes out. Technically, my favorite edition of D&D is 4th, but it occupies that position for very specific reasons. It allows me to run cool, flashy battles in the style of turn-based tactical RPGs such as Disgaea, Fire Emblem, or Final Fantasy Tactics. If I want a campaign that feels like that, I reach for D&D 4. If I don’t want to run a campaign that feels like that, my tastes get a bit fiddlier. I will play D&D 5th edition if no other alternative presents itself, but it doesn’t look very exciting to GM. Earlier editions add to that an elaborate list of varied complaints that I’m sure anyone familiar with them can guess, and I’m not one of those enlightened souls who can forget about them for long enough to enjoy a session. The Dungeon Fantasy Roleplaying Game has a premise that’s exactly like that of Basic D&D (one of the most popular OSR darlings), married to a ruleset that does everything most editions of D&D do in a way I find better. It’s point-based! It has a unified mechanic! It has a good skill system! Warrior-types are actually better at combat than spellcasters! You can of course also run flashy set-piece battles with it, and they’ll tend to have a feel that’s closer to that of the old-school editions. It takes all of that from GURPS. 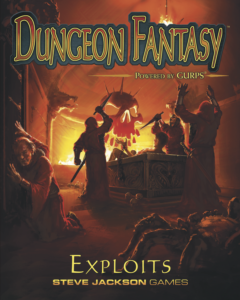 Its rules are a specialized version of GURPS 4th Edition, with everything that’s not relevant to dungeon-crawling fantasy campaigns stripped out and the rest adapted to the purpose. Some parts are simpler than in the original rules, some are not, but they’re all useful. A lot of those things which usually lead to heated arguments between players and DMs are given proper rules and effects here. Want to stab that ogre in the eye? Perform some unlikely feat of parkour? Check to see if that dead monster has valuable body parts? The system has you covered. Dungeon Fantasy gives you 11 “professional templates” that are roughly equivalent to some of the most popular D&D classes, and which can be humans or one of a selection of 8 racial templates that includes all the usual suspects plus the Catfolk1. While the game focuses very heavily on dungeon-delving, it’s certainly possible to use it for fantasy campaigns that go beyond the dungeon. It has more support for social interaction than Basic D&D does2, and bringing in more detailed rules from GURPS is extremely easy, if the GM thinks it’s necessary. So yes, if I was planning on running a D&D-ish campaign and wasn’t after the very specific feel of D&D 4 combat, I would use Dungeon Fantasy in preference to any other actual edition of D&D. In fact, I have been doing just that for years using the previous iteration of these rules, and will gladly switch to the new one now that I have it in my hands. Dungeon Fantasy isn’t yet available to the public as of this writing, but the Kickstarter backers have already begun receiving their copies. Both the printed and PDF versions should appear on Warehouse 23 in October.